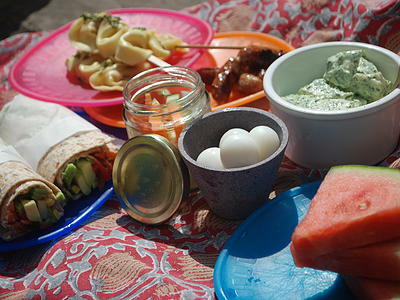 When the sun arrives it’s great to have some picnic inspiration. It can be a real challenge to think of new and exciting ideas for picnics and packed lunches and often we are left churning out the same food. 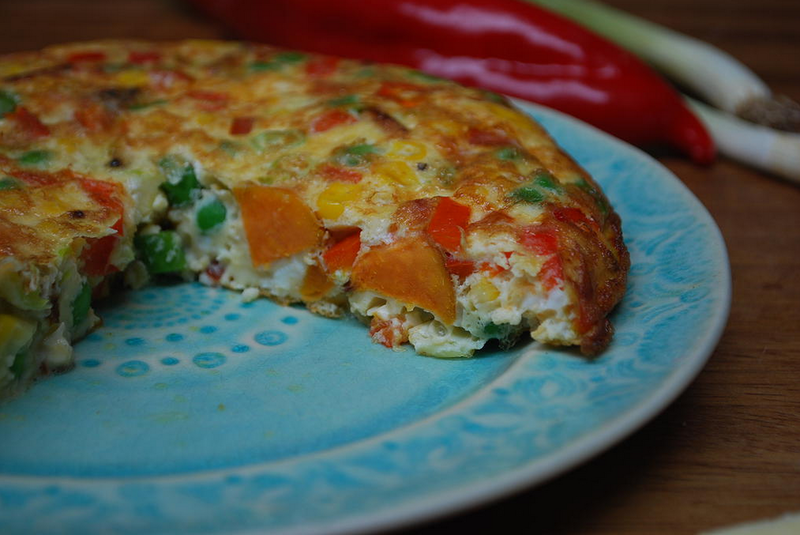 At Cooking them Healthy we have done the hard work for you and have been thinking up wonderful, fresh and fun new ideas for time-saving and easy picnic ideas. Here are a few we think are great! 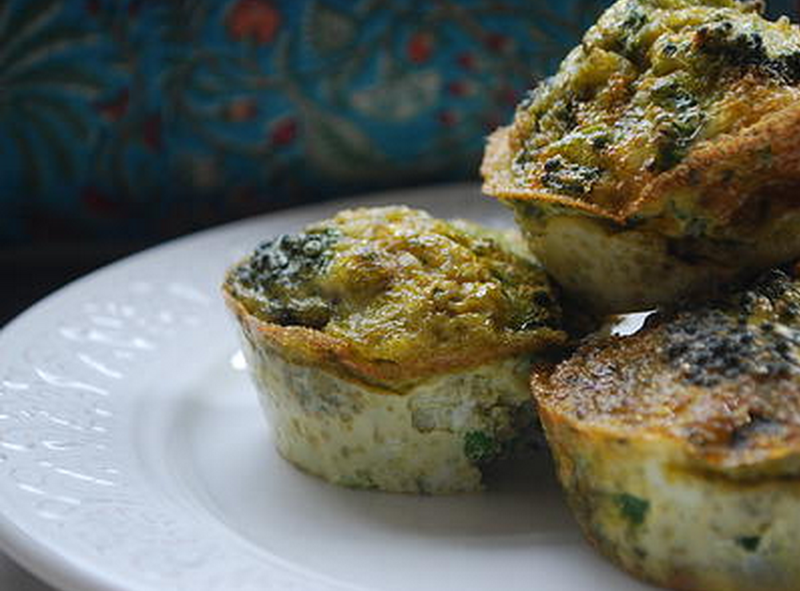 These are perfect for picnics and are packed full of protein and make a handy bite-size snack. My children call them “mini eggs”! 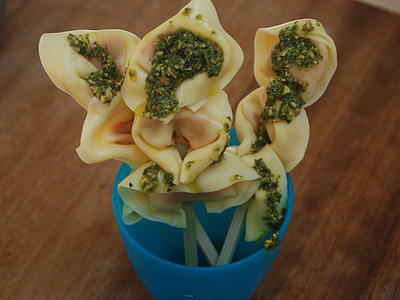 Buy pre-made tortellini, cook and thread onto a skewer. 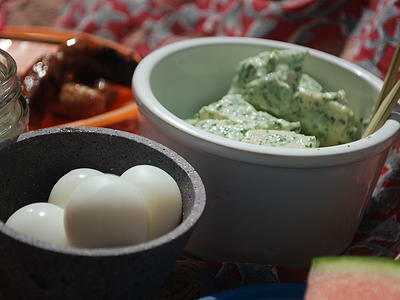 Ideally drizzle with some fresh pesto or use it as a vehicle for dips. 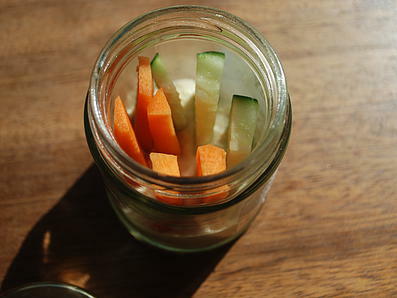 Spoon some hummus into a jam jar, cut up some carrot, pepper or cucumber and place inside. Screw on the lid and you are ready for an instant, no mess picnic dipper. Buy some watermelon and cut into slices. 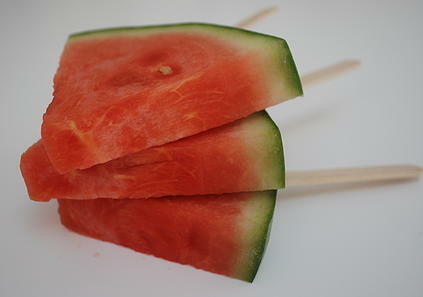 Cut a small slit into the skin of the watermelon and place a ice lolly stick inside. A healthy, fun lolly! Simply get a wholegrain wrap, spread hummus, goat’s cheese or any of your favourite dips down the centre of it and pile with a variety of fillings. Ideas include sweetcorn, grated carrot, beetroot, pepper, lettuce, etc. Wrap it up tight and either cut in half or into smaller bite-size pieces. This is a great way of getting a lots of veg into your children in a fun way. An easy cold, saucy, chicken dish. 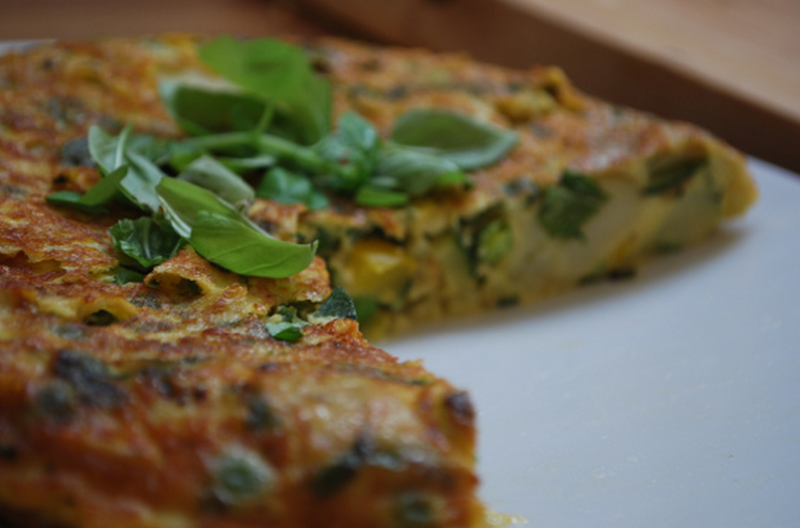 Think Coronation Chicken but a healthier variety. 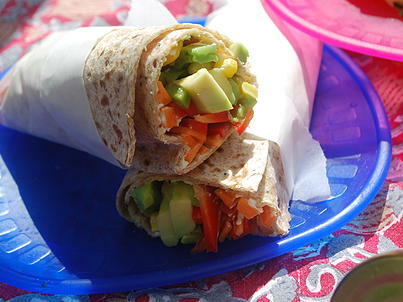 This is delicious in a wrap! Cook two chicken breasts: either simply roast in the oven for 10-15 minutes, poach in some water for 10-15 minutes or use leftover chicken from a roast. 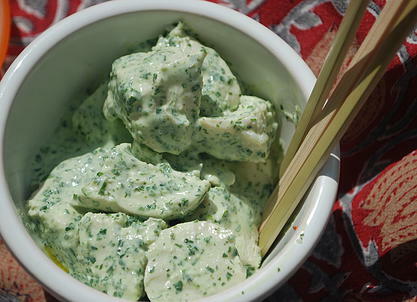 Chop it into mouth-sized pieces and mix through our herby yoghurty sauce (recipe below). This is a great sauce to have in your fridge to throw on pasta or dip pitta in. Herbs have fantastic health boosting properties and we encourage you to use them liberally in your cooking. Parsley, for example, is packed full of vitamin C. Yogurt is naturally rich in healthy good bacteria to support digestive and immune health. Place all in a small Magimix, or use a hand blender, to blitz everything together to get this incredibly vibrant sauce. Will last in your fridge for 2-3 days. Mix this through your chicken and serve. Great with cold new potatoes.